Alas and alack. It seems that Symphony is so obscure that I can't find a picture of symphony grapes anywhere online (or ripe grapes in any case...there are a few pictures of some tiny green berries that look like under ripe grapes, but most under ripe grapes all look the same anyway). 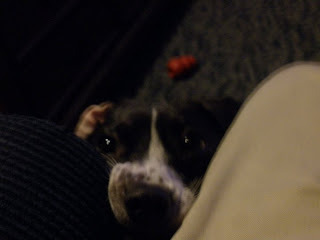 So instead here's a picture of my dog desperately trying to get my attention. Once upon a time in California, there was a guy named Harold Olmo who made his living creating new species of grapes either by crossing two vinifera species or by crossing two different vitis species. We've met people much like Olmo here before: Seibel and Landot were both French scientists with many crossings and hybrids to their credit. Olmo was based at UC Davis in California and created many widely used grapes like Ruby Cabernet, Emerald Riesling and Rubired, among others. What he and many other scientists at UC Davis were interested in was creating grapes that could withstand the climates of some of California's less than ideal growing sites. To that end, his work was very successful, as Ruby Cabernet and Rubired are widely used in bulk wine production in areas like California's Central Valley which is far too hot for most wine grape varieties. The problem is that the wine produced from these grapes tends to not be of particularly high quality and lack character. Symphony is anything but a characterless grape. Dr. Olmo worked for thirty years to perfect this crossing of Muscat of Alexandria and Grenache Gris before he introduced it commercially in 1981. It has not exactly caught fire in California, as there were only about 700 acres (280 ha) under cultivation in California as of 2004 (other states have some plantings as well). The largest plantings of Symphony are owned by the Kautz family who also own Ironstone Vineyards. Their bottling is called "Obsession" and it is 100% Symphony. I picked up a bottle of their 2009 vintage for about $10. In the glass, the wine is very pale silvery lemon color with a greenish tint. The nose on this is very assertive and very flowery. It is immediately apparent that this grape picked up a lot of the Muscat character from the crossing. There were also some ripe, citrusy grapefruit aromas as well, but flowers is the overpowering message here. On the palate, the wine is light bodied with medium acidity and a little sweet. Their website indicates that there is 1.62% residual sugar here, but it tastes a little sweeter because of the flowery aromas, I think. There are orange blossom and mandarin orange flavors along with some apricot-like stone fruit characteristics and the flavor that Muscat brings to the table that can really only be described as "grapey." The finish is carried by a nice lingering, mouth-watering minerality. On the whole, this is a pleasant, slightly sweet little sipper. The acidity could stand to be a little higher, but it's not a real deal-breaker or anything. The flowery aromas and flavors were too much for my wife and she couldn't make it past a single glass. It's hard to go wrong here with the price, as Muscat-based wines will typically run you at least twice this so if you're on a budget, this is a very good option. I can't see this ever really replacing a nice Moscato d'Asti or an Alsatian Muscat in my cellar but it is certainly an enjoyable drink that I can imagine really hits the spot on a warm summer day. I'd like to start this post out with a public service announcement: if you have Google's safe search turned off, I do not recommend doing an image search for Schiava if you are at your place of employment or in any other public setting. You should probably make sure you search for "schiava grape" or "schiava wine" unless you want to get quite a surprise. With that out of the way, we can now focus on today's wine. When we think about other countries, it's too easy to fall into the trap of thinking of whole countries as a single undifferentiated monoculture. With Italy, for example, it's easy to think that the whole country eats the same kinds of foods or even speaks the exact same language within its borders. For the US readers who aren't totally with me yet, think about how different the cultures of Georgia and Massachusetts are (a cultural divide that I've lived and experienced, being originally from Georgia and currently located in Massachusetts). One of the great things that has happened in writing this blog is that I've been able to look at smaller regions and see the differences in these regions compared to other regions within the same country. Some of the most interesting regions are those that are on a country's borderline, like Alsace in France. There is often an interesting mix of two cultures in these geographical regions that borrows some from each, but is individually distinct from both. The Alto Adige region of Italy is one of these border territories. Located in the northeastern corner of Italy, Alto Adige constitutes the northern half of the Trentino-Alto Adige zone and is the most northerly section of Italy. It is a mountainous region (it is estimated that only about 15% of the land here is suitable for agriculture of any kind) that shares a border with Austria and Switzerland. Historically, the region was a part of Austria-Hungary and that empire's predecessors, but the region was annexed by Italy following World War I. The culture here is very Germanic and the region has two official languages: German and Italian. On wine labels, you are as likely to see "Alto Adige" as the region as you are to see its Germanic name, Südtirol, which means "South Tyrol," so named because the southern part of the Tyrol river flows through here. Most production in this region today is focused on white wines, though at one point in time Schiava was by far the most widely grown grape in Alto Adige, accounting for 60% of the region's production, though that number has shrunk considerably in the more recent past. There are some other interesting native red grapes that can be difficult to find in the US. Lagrein and Teroldego are grown here and they will be the focus of a future post, but today's wines are made from Schiava, aka Trollinger, aka Vernatsch. Schiava has been grown in Alto Adige since the 15th Century and in Württemberg, Germany since the 17th Century. 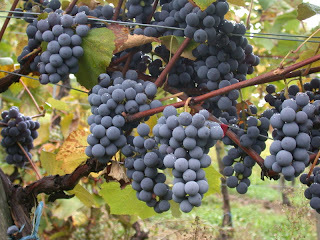 It is eaten as a table grape in Great Britain under the name Black Hamburg. It is a vigorous and hardy grape that must be aggressively pruned and managed in the vineyard to prevent out of control yields. The grape is thin-skinned and not particularly powerful in the first place so overcropping can have serious deleterious effects. The wines produced from Schiava are rarely imported into the US because even at their densest, they tend to be light in color and extract and resemble hearty rosés rather than the full bodied red wines that are currently in such fashion in here. Schiava as a varietal is rarely printed on a wine label, but the first wine under consideration today is a varietally labeled 2009 Schiava Nera from the Vigneti delle Dolomiti IGT region. The producer was Gino Pedrotti and the wine was $20. In the glass, the wine was a very pale ruby color. It resembled a dense rosé more than a red wine (I'm certain I've had Argentinian Malbec Rosés that were denser than this). The nose was full of bright red strawberry and raspberry fruit. In the mouth, this was light bodied with good acidity, but a little hollow. There were some dusky raspberry and strawberry flavors, but the overall impression was that there was something missing in the midpalate. Stylistically, it was definitely right between a rich rosé and a very light Pinot Noir (like the Rhode Island Pinot tasted here previously). Overall, it was fairly nice and refreshing and is tremendously versatile with food, but there are many rosé wines that would I would rather have for much less money. The second Schiava wine was from the St. Magdalener DOC (it is sometimes printed as Santa Maddalena...it really depends on whether your producer is more German or Italian leaning in their disposition). As you can see from the label at the left, if you just took a quick glance at this bottle, you would probably think you were about to have a German wine. This is another 2009 bottling from Georg Mumelter Griesbauerhof which cost $19. Once again, the color was a light ruby in the glass. The nose was full of red berries and the raspberry component was a bit more pronounced here. The wine was light bodied with good acid and no tannins. There were waxy red cherry and strawberry fruit flavors and a more pronounced dusky earthiness that came through on the finish tasting like bitter dried herbs. This wine was much denser and more complex and had fuller, riper fruit flavors. It definitely drank more like a light-bodied red wine rather than a meaty rosé. My biggest complaint here was that the alcohol tasted a little out of balance, giving this an almost cough-syrup kind of flavor. Still, it is a unique wine experience and one that certainly has its place at the table. It would pair with pretty much anything you would throw at a light-bodied Pinot Noir and do quite well with it I believe. The biggest sticking point with these wines is price, as it's tough to justify spending $20 a bottle for these wines. I'd be comfortable in the $12-$15 range with these all day long but am a little less enthusiastic at the $20 price point. Like our friend Palomino Fino, Pedro Ximenez is probably not a fringe wine if we consider only its best known incarnation. In the Jerez, Montilla-Moriles and Malaga regions of Spain, Pedro Ximenez is used to make very sweet dessert wines that can age for many decades. We're not interested in Spanish Pedro Ximenez and we're not interested in dessert wines here, but rather a dry table wine made in the Elqui Valley of Chile. The Elqui Valley is located in the DO Coquimbo region of Chile, about 300 miles north of Santiago. It is Chile's northernmost wine producing region which means, since they are in the southern hemisphere, it should be the warmest region. Parts of the region are certainly warm, but Chile is very mountainous, and many vineyards are located high in the Andes mountains, some as high as 6,500 feet above sea level. The altitude has a moderating influence on the climate and allows the grapes to receive more intense sunlight during the day. There is also a large diurnal temperature variation which allows many of the grapes to retain a high level of acidity while ripening fully, an important consideration for a grape with low natural acidity like Pedro Ximenez. 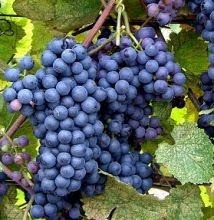 The grape is named after an almost certainly apocryphal Spanish soldier named Pedro Ximenez (or Pedro Siemens or something similar) who, according to the story, brought the grape back to Spain on his return from the Spanish Netherlands early in the 16th Century. It is very unlikely, though, that a grape that flourishes in the hot, southern Spanish climate would be of much use that far north. There also does not appear to be any grapes currently in that region of the world that resemble Pedro Ximenez, so the story itself isn't taken very seriously by wine researchers. The most likely origin for the grape is somewhere in the Canary Islands where the grape is still grown and made into mostly nondescript table wine. There are large plantings of a grape called Pedro Gimenez in Argentina and Chile, but this grape is not thought to be related to Pedro Ximenez. 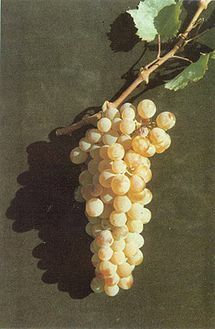 Most of the grapes grown under the Giminez moniker are used in local table wines in Argentina or are distilled into Pisco in Chile. As far as I can tell, though, the bottle that I was able to get is actually from Pedro Ximenez and not from the lesser Gimenez variety. Pedro Jimenez is a frequent synonym for Pedro Ximenez in Chile, but my bottle definitely was labeled Ximenez (Pedro Ximenez Reserva, actually, though I don't believe that Reserva has any legal definition in Chile). The producer for the bottle I picked up was Falernia which is apparently the northernmost wine estate in Chile. It cost $10 and was from the 2009 vintage. In the glass, the wine was a very pale silvery straw color. The nose was reserved with some honeysuckle and apricot and white peach notes. It was pretty flowery smelling when you could tease an aroma out of the glass at all. The wine was light bodied with medium acidity. The flavors were reserved and tended to follow the nose pretty closely: white peaches and honeysuckle. It had a steely crispness to it that was nice and refreshing. This isn't the most complicated wine in the world, but it was charming in its way. It had more character than the Palomino I tasted previously, which isn't saying much, I suppose. It would make a nice aperitif or would go with delicate seafood dishes, but probably not anything more assertive than that. For some reason, the Marche region of Italy keeps popping up around here. It's not a particularly prolific region, but I am continually finding oddities from there on the shelves at my favorite local shops. Today's wine is Bianchello del Matauro, a white wine made from the Bianchello grape in the valley surrounding the Matauro stream in the northern portion of the Marche. The wine history here goes back a long ways. There's a story about a battle by the Matauro stream where the Roman army defeated and turned back a Carthaginian force led by Hannibal's brother Hasdrubal. As the legend has it, the Roman army's triumph was inspired by their copious consumption of Bianchello wine prior to the battle (which is strikingly similar to the tale about Bull's Blood). The grape goes by several different names. Biancame is the most common synonym, though Bianuccio and Greco Bianchello also are used (it is thought that Bianchello might be a clonal variant of the Greco grape). 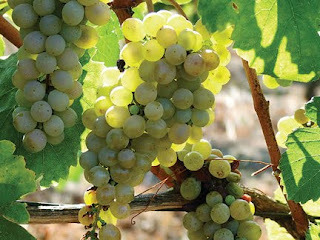 One source seems to think that Bianchello is the same grape as Ugni Blanc/Trebbiano Toscana, which is the grape most famous for being the base of Cognac. I do not find this information duplicated anywhere else, so I'm wary about the claim and will doubt it until I see corroboration from somewhere else. In any case, Bianchello is thought to be native to Italy and has a history dating back to at least 500 BC. The Bianchello del Matauro region was one of the regions inaugurated into the first DOC classification undertaken in Italy in 1969. And, that's about it. There isn't a lot of information out there about this grape, it seems. I was able to pick up a bottle of the Fiorini "Tenuta Campioli" bottling from 2008 for about $14.50 from my friends at Bin Ends. The Fiorini website says that they produce about 70,000 bottles (less than 6,000 cases) of this per year and that the wines are sourced from 100-year old vines. It is typically advised that one should drink this within one year of the vintage, but it seems like Fiorini has tried to create a wine with the structure to age a bit. In the glass, the was a pale straw color and brilliantly clear. The nose was a bit reserved, with some crisp pear aromas. It was pretty full bodied with a thick, creamy texture in the mouth and medium acidity. There were some creamy pear flavors, but that was about it for the fruit. This wine was all about steely minerality, which was very surprising to me given how heavy it felt on the palate. Usually all that weight carries a bigger fruit load, but this was definitely more clean and fresh on the palate. My guess is that this wine was a little past its prime and had lost a good portion of its fruit content. It was certainly enjoyable as it was, but some fresh fruit flavors could have really put it over the top. It may be pretty difficult to find this in the US within a year of the vintage, but if you do, I'd recommend that you go for it and take a chance. The island of Crete has a long history with the vine. 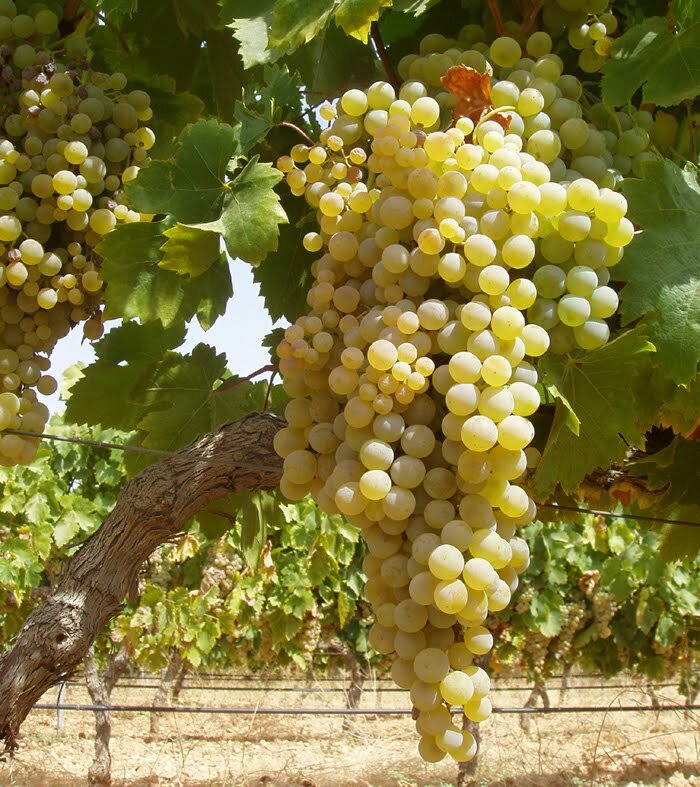 Archaeological evidence indicates that the Minoans were cultivating grapes specifically for wine production as early as the second millennium BC. Like the rest of Greece, Crete has had its ups and downs in the wine trade, waxing and waning through the series of conquests that Greece has been subject to. After centuries of rule by the Islamic Ottoman Empire, Greece won their independence in 1830, but Crete was not returned to the Greeks until 1913. Ottoman rule had a stultifying effect on native viticulture, and winemaking in Crete did not begin to rebound until the 1930's. Today, though, Crete accounts for one-fifth of all Greek wine production. Crete is the largest of the many Greek islands and is the second largest island in the Mediterranean Sea. It is 160 miles from east to west and varies from 7.5 miles to 37 miles wide from north to south. Despite its southern latitude, Crete enjoys a mild, Mediterranean climate mediated by the Sea of Crete to the north, the Mediterranean sea to the west and the Libyan Sea to the south. The geography of the island is mountainous with three different ranges stretching from west to east. The capital is Heraklion (named for Hercules in a very roundabout manner, apparently), in the Heraklion (or Irklion) Prefecture, which is where today's wine hails from. The island is perhaps best known for its production of red wine, but they also make quite a bit of white wine as well. Heraklion is located on the northern coast of Crete, almost right in the middle of the island. Vilana is the dominant grape of this region, though specific production figures are difficult to find. It's also somewhat difficult to find much information about Vilana. It seems to be a workhorse grape that is not widely grown off the island of Crete. It is capable of high yields, a feature that many producers indulge and exploit, and their wine suffers for it. Ideally, it should be grown on hillside sites with clay-limestone soils or sandy clay. The grape oxidizes easily, as most white grapes do, so care must be taken in the winery. The bottling I found was from Creta Olympias and was called Vin de Crete. It was from the 2007 vintage and ran about $11. In the glass, the wine had a lemon yellow color that was tending towards gold with reserved aromas of red apple and butterscotch. From the color and aroma, I was pretty sure that this was definitely past its prime and possibly a little oxidized, but I pressed on. The wine was dry and a little heftier than medium boded with a creamy mouthfeel and fairly good acidity. There were flavors of apple peel, butterscotch, toffee bitter almond. The wine felt a little hollow in the mouth and had a kind of metallic tang to it. There's little question that this was well past its prime. If I can find a more recent bottling of this, I will be eager to try it, but the age and condition of this wine really preclude me from making any kind of general judgment about the grape. There is certainly no shortage of interesting and unusual grapes and wines in Italy, but today's wine is certainly one of the oddest ones I've ever had. There's nothing inherently strange about the Fiano grape; it doesn't have an interesting back story and there aren't any real oddities about its color or growing cycle or where it's grown. Everything about it suggests that it's just another white wine grape...until you pour it in the glass. Fiano is grown in Campania, a region that looks like it forms the lower shin of Italy's boot. Campania is located just south of Lazio and just north of Calabria, the toe of the boot. The most famous city here is Naples and, historically, the most interesting thing about Campania is that it is home to Mount Vesuvius and Pompeii. There is quite a bit of wine produced in Campania (the most famous wine here is Taurasi made from Aglianico grapes), but only seven percent of the production is DOC classified (there are three DOCG regions and sixteen DOC regions). It ranks sixteenth in DOC production out of the nineteen regions in Italy, but ranks ninth in total production. 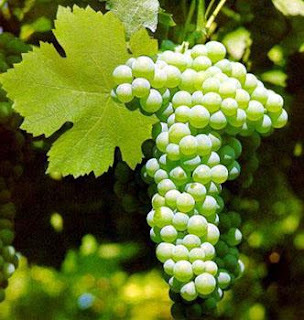 Fiano di Avellino is a DOCG located around the village of Avellino in a hilly region of central Campania known as Irpinia. The region was devastated by an earthquake in 1980 (it is located about 20 miles inland from Mount Vesuvius) and the rebuilding efforts have contributed to give the region a more modern look and feel. Fiano has a long history in Campania, which seems to be its native home. The Romans called the grape vitis apiana because of the way that bees were attracted to its juice (apis is the Latin word for bee). I would guess that Fiano is a linguistic corruption of apiana; among the synonyms listed for the grape are Apiana and Apiano, and I can see how Apiano could eventually morph into Fiano. It is not a prolific yielder and oxidizes relatively easily, but it makes up for these defects by having a naturally high acidity and a very distinctive flavor. I was able to find the Pendino Fiano di Avellino bottling by Colli di Castelfaranci for about $20 from Central Bottle in Cambridge (I didn't write down the vintage in my tasting notes, but I'm pretty sure this was a 2009). In the glass, the wine was a yellow straw color. Fiano is described as an aromatic grape, but this wine wasn't very effusive on the nose; it had aromas of pine needles and lemon with a touch of green herbs and pine nuts. It did eventually open up a bit, but it was never what I would call highly aromatic. On the palate, the wine was medium bodied with medium acidity. My first tasting note on this wine simply states "weird," and it is weird. It has a very nutty flavor reminiscent of toasted pine nuts and hazelnuts with a touch of flinty smoke. There are some green apple and lemon flavors in there, but the overwhelming flavor sensation is nuts. Bastianich and Lynch in their Vino Italiano say the flavor of Fiano is "almost pesto in a bottle," and they're pretty accurate. With a bit of age, I've read that this can pick up some honey and flower aromas and flavors, but this wine was very savory. Bastianich and Lynch share a quote from Enzo Ercolino of Feudi di San Gregorio winery where he states that "there's a selvático [savage] quality to Fiano that sets it apart," and that's really a great word for it. Many white wines are graceful or voluptuous or "pretty," but there aren't many that are just plain savage and rough. This one definitely is and it's all the more interesting for it. The pesto in a bottle description is a good indicator of the kinds of foods that this would compliment. It is not a wine I would recommend drinking on its own (unless you're the kind of person who enjoys eating pesto with a spoon), but it would be a great match for pesto-based dishes or chicken or pork dishes seasoned with Italian herbs. 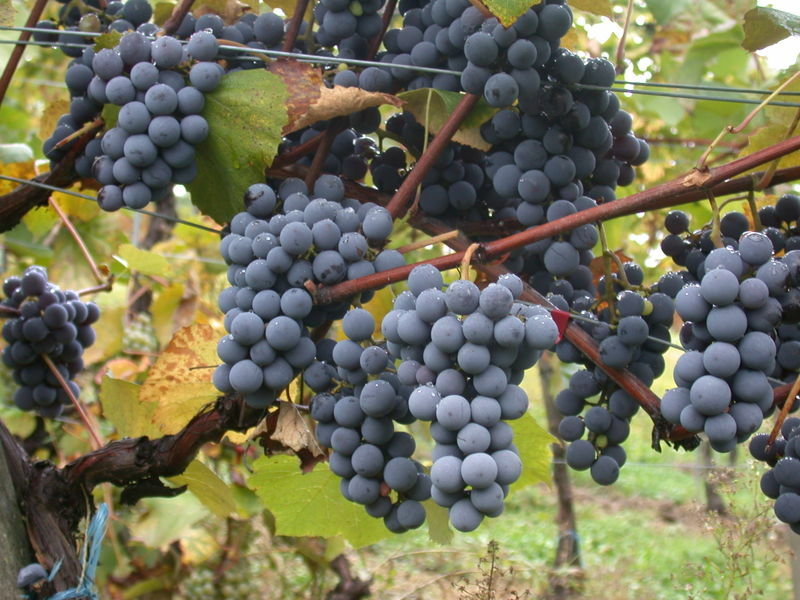 Gamay is one of the most popular and polarizing grapes in the world. Millions of people enjoy it as Beaujolais Nouveau, Beaujolais Villages or as a wine from one of the criminally underrated Beaujolais Cru villages (Morgon, Fleurie, Moulin a Vent, etc.). Millions of others write the wines off out of hand citing their lack of complexity or lack of aging potential or their lack of seriousness. B The wine and the grape get a bad rap because Beaujolais is, at heart, just plain fun and it seems somehow wrong that a beverage as expensive and serious as wine should ever stoop to the level of fun. The Gamay hate has deep historical roots. In 1395, Philip the Bold, the youngest son of King John II who was barred from the throne because of the claim his older brothers had to it, was then the Duke of Burgundy. He issued an edict that all Gamay be "extirpated, destroyed and reduced to nothing" and described the grape as "the vile and noxious gamay plant, from which plant comes a very great abundance of wine...which wine is of such nature that it is most injurious to the human creature...for it is full of a very great and horrible bitterness." Well, Gamay eventually found itself a home in the Beaujolais region of Burgundy and is also grown in the Loire Valley, Switzerland, Canada and Oregon (for those interested, Rudolf Chelminski's I'll Drink to That: Beaujolais and the French Peasant Who Made it the World's Most Popular Wine is a great history of the Gamay grape, the Beaujolais region and George DuBoeuf, the man who made Beaujolais famous again). The wine in question today, though, is from the Beaujolais region of France, where millions and millions of bottles of wine are produced and shipped all over the world. Have I decided to drop the Fringe Wine mantle and go full mainstream? Not exactly. The wine being examined today is a sparkling Beaujolais. No, not a sparkling Beaujolais like Champagne is sparking Pinot Noir. Today's wine is not even a blush wine made from Beaujolais. No, today's wine is a full-on red sparkling wine made from 100% Gamay grapes in the Beaujolais region. Domaine des Nugues is an estate wine producer in a region dominated by negociants. Most of the wine produced in Beaujolais comes from giants like George DuBoeuf who buy grapes and juice from local growers and make the wine at a large commercial winery. These large companies may own some vineyard area, but much of their juice is bought from farmers who don't have the resources and/or the desire to create their own wine from their grapes. It appears that Domaine des Nugues is one of the few exceptions. They appear to own vineyards in various parts of Beaujolais and vinify and bottle their own estate wines. The sparkler is called "Made by G" and it's made from grapes from 25 year old vines. The wine is fermented using the traditional Champagne method. I was able to pick up a bottle from my friends at Bin Ends for around $19. In the glass, the wine is a bright, pinkish purple with fairly heavy effervescence. As far as I could tell, this was a NV bottling, so the bright color was a good indication that this was still pretty youthful. The nose was pretty reserved, especially for a sparkler, with some cranberry aromas in there. In the mouth, the wine tasted like it had a touch of sweetness. The Domaine's website says that there is no residual sugar in the wine and that the sweet sensation comes from picking very ripe fruit, but I have my doubts. The alcoholic content here is only 9% and I find it nearly impossible to believe that super-ripe fruit would ferment to full dryness and only end up at 9% abv. Whatever the reason for it, this was just a touch sweet, though it's not a dessert wine by any means. This is fully sparkling and not just frizzante like sparkling Italian reds tend to be. The acid here is pretty high and there are cranberry and tart cherry flavors. Overall, this is a pretty simple wine that's pleasant and easy-going and really, what more would you expect from Gamay? Serve this with just a slight chill on it and then treat it like you would any other wine from Beaujolais. As long as you don't expect it to completely blow your mind, Gamay does it have its small pleasures and its place at the table. I can't prove this, but I would guess that wine drinkers (at least American ones) have a bias for grape names that sound like they originate from a Romance language. If you take a good look at the list of grapes that dominate the marketplace, nearly all of them have a French, Italian or Spanish name. Now, I'm not saying that it's purely a linguistic preference that has elevated Cabernet Sauvignon or Chardonnay to their esteemed positions. In fact, I think it's probably the opposite effect; since most of the big time wine grape names have a certain kind of sonic resemblance, then we are probably more likely to associate similar sounding words with quality wine than we are words that sound drastically different. Like Zweigelt, for instance. In the pantheon of mellifluous grape names, Zweigelt sticks out a bit, but it could have been worse. It was created in 1922 by Fritz Zweigelt in Klosterneuberg, Austria, who originally named it Rotburger, which would be a very tough sell in the US. There is another red grape created in 1928 by crossing Trollinger (Schiava) and Riesling that goes by the name of Rotberger which is completely unrelated (interestingly, there is also Kerner, which is a white grape with the same parentage). My first thought was that perhaps Zweigelt came to be named after its creator in order to avoid confusion with the other grape, but it appears that Rotberger is hardly planted, and, in some places, the old Rotburger name is still used. My guess is that it was probably a marketing decision that somebody made to make the wine sound a little friendlier to non-German speaking consumers. In any case, Zweigelt was created by crossing Blaufränkisch and St. Laurent. Austria, like its neighbor Germany, is predominantly a white wine producing nation and most of their focus is on Grüner Veltliner and Riesling (in fact, almost two-thirds of all wine production in Austria is white wine). Zweigelt is the most planted red grape in Austria, accounting for about 10% of the total vineyard area. It is not limited to a particular place, but seems to be grown all over Austria and even Canada is beginning to have some significant Zweigelt plantings. The grape has a late bud break, which allows it to tolerate colder climates a bit better since it can miss many of those early frosts that can decimate vineyards. It is also early ripening which further shortens the growing season, allowing the extremes at both ends of the growing season in many northern climates to be bypassed. Zweigelt is relatively accessible in US markets. Many larger wine shops may have one or two different bottles kicking around in the German section. I was able to pick up a 2008 Gobelsburger Zweigelt for about $15. In the glass, the wine was a mulberry purple color with medium saturation. The nose had a little funky earth thing happening with raspberry and strawberry fruit and a wet leaf character. On the palate, the wine was medium bodied with fairly high acid and little tannins. There were racy tart cherry, tart plum, and wild strawberry flavors with a bit of clove and allspice hanging around. The funkiness in the nose doesn't really extend to the palate, which is a very good thing for me. Some people are very tolerant of or may even relish those funky, gamey notes in a wine but they are generally unwelcome for me. This wine is very similar to its parent Blaufränkisch and also shares some similarities with Pinot Noir as well. This is a very versatile food wine that could probably cover everything from salmon or tuna fish dishes up to roasted red meats. I would probably stop short of grilled meats with this wine and reach for something with a bit more stuffing to it. I've recently been able to try a very interesting sparkling Zweigelt from Ewald Gruber called "Punkt Genau," which means "on the dot." This line and winery is perhaps best known for its production of sparkling Gruner Veltliner (which will be featured on this site soon). These are non-vintage bottlings and this particular wine ran me about $15 from Bauer Wine & Spirits. In the glass, the wine was a very pale pink color with frothy bubbles. The nose on this was very fruity with nice strawberry and candied red raspberry notes. On the palate, the wine was very fruit-forward with strawberry and raspberry fruit and nice acidity. The bottle says this wine is dry, but it tastes a little sweet, either because of the strong fruitiness or because there may just be a touch of residual sugar here. I'm not sure how this wine was fermented, but it was probably done in the Charmat method or it was laced with CO2. The style here is definitely more frizzante than fully sparkling and there's virtually no chance this is traditional method as it just doesn't have the yeasty, toasty secondary fermentation aromas or flavors that you get in a traditional method sparkler. The wine is actually under screwcap, which is a new one to me in a fizzy wine. It's a very clean, refreshing, friendly wine that would be great with brunch or just to unwind on a hot day. Italy's Piemonte is a seemingly bottomless well of wine. There are a whopping 52 DOCG and DOC zones in Piemonte with a dizzying array of grapes and styles mixed through the region. I have briefly touched on a number of the wines here, but, as I realized not even 24 hours after writing that post, Piemonte's riches are more numerous than I had thought. Bastianich and Lynch's book Vino Italiano lists 12 different grape varieties used in Piemonte (of which, at least 8 will have posts on this blog). I am certain that their list is not comprehensive either, as I have a bottle of something called Verduno Pelaverga which is made from the Pelaverga grape and is notably absent from their list. If you had to drink wine from just one region for the rest of your life, Piemonte would be an excellent choice if you value quality wine production and diversity in equal measure. 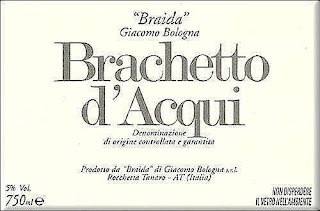 For Brachetto d'Acqui, Brachetto is the name of the grape and Acqui (or, more specifically, Acqui Terme) is the name of the town. Acqui Terme is located in the Alessandria province in southeastern Piemonte, very close to the border with Liguria. Oz Clarke rather cryptically calls Brachetto "one of Italy's more unusual grapes," though he doesn't elaborate any further than that. It is thought to be native to the Monferrato Hills of Piemonte, though no one is really sure. 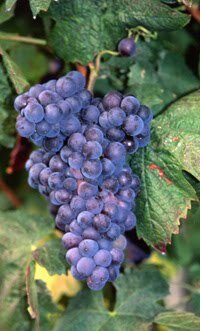 For awhile, Brachetto was thought to be identical to the French grape Braquet, but recent research seems to indicate that they are two distinct varieties. 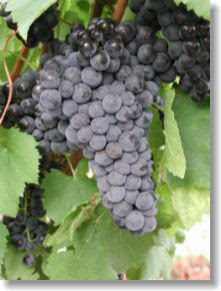 Like many Italian grapes, it seems that there may be several different sub varieties of the Brachetto grape. 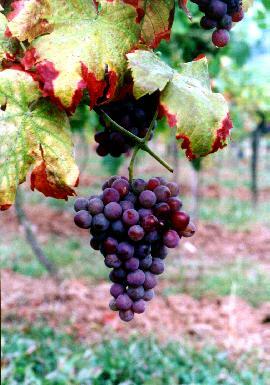 The grape currently used in Brachetto d'Acqui bottlings won out over other varieties such as Brachetto del Roero in a battle that was theoretically based solely on taste and marketability, but which probably had as much to do with politics as it did with the perceived superiority of any particular sub variety. Brachetto d'Acqui was promoted to DOC status in 1969 and was further promoted to DOCG in 1996 in part, it is thought, due to the excellent pairing the wine makes with the famous chocolates made in Piemonte. Of course with DOCG status comes a certain set of restrictions: the wine must be made from 100% Brachetto grapes that were harvested with yields below 8 tonnes per hectare. The wine must have a potential alcohol level of at least 11.5% with at least 5% of the sugars actually converted to alcohol for the frizzante wines and 12% potential alcohol and 6% fermented alcohol for the spumante wines (potential alcohol is simply a measure that tells you that if all of the available sugars in the juice were converted to alcohol, what the alcoholic strength would be). 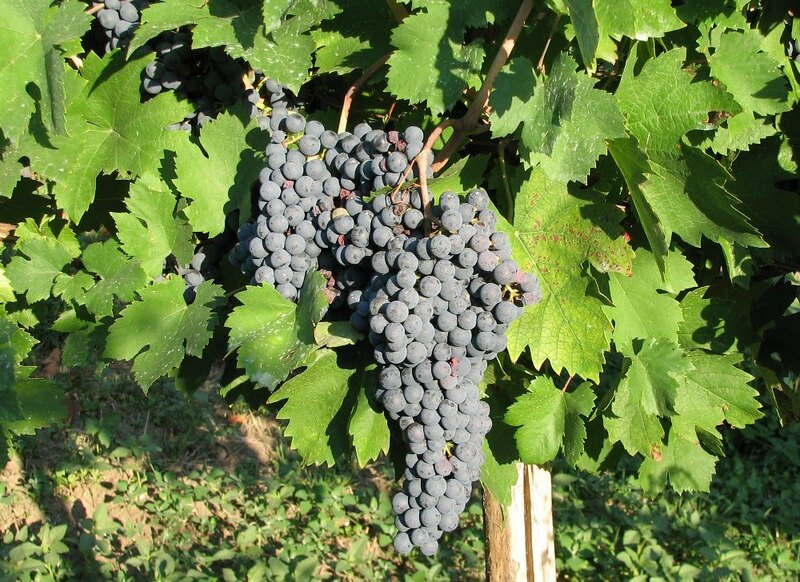 There are still wines made in the DOCG zone which can be either sweet or dry and there is a further blanket Piemonte Brachetto DOC that merely stipulates that 85% of the final blend must be made from Brachetto grapes. The overwhelming majority of examples you are likely to run across are the sweet, frizzante wines. Rosa Regale is a very widespread brand that is easily available for most consumers. I've had it before and while it's pretty good, it has nothing on Giacomo Bologna's "Braida" bottling. The "Braida" wine is a little more expensive, but it's definitely worth the extra money. I've paid over $30 for it full retail, but the most recent bottle I had (the 2007 vintage) was around $23 from my friends at Bin Ends. In the glass, the wine was a pale purple red color with little saturation and a few bubbles hanging around. The nose smells like strawberry candy and is bursting with bright red fruit with a bit of a rose/violet floral element hanging around. In the mouth, the wine is sweet and lightly fizzy with candied strawberry and raspberry flavors. There's a nice acidity to the wine too which keeps it interesting and lively in your mouth. At four years old, this wine was slowing down a bit so ideally, you should consume this in the most recent vintage you can get your hands on. It is a knockout Valentine's Day wine that goes well with both chocolate and red fruits (chocolate covered strawberries are probably the Platonic ideal for a pairing here). Brachetto is a crowd pleaser of a wine and is the perfect gift for that someone on your list who isn't generally a fan of wine, but who still has an easily accessible sweet tooth. Recently I picked up a still example of Brachetto, though since it wasn't 100% Brachetto, it was labeled as a table wine. The bottle was a 2009 Pasquero Hilberg "Vareij," which is 60% Brachetto and 40% Barbera. I got it from my friends at the Wine Bottega for about $23. Hilberg's philosophy, in their own words, "is based on symbiosis and empathy with nature. Man must not exploit natural resources but, rather, like a guide, ‘domesticate’ what is wild in nature with care and love so that it can become useful and benevolent." To that end, they cultivate their vines with horses and oxen rather than tractors and machinery. The bottle that I bought seemed to have a minor cork failure issue, as the cork was stained all the way out to the end and the edge of the bottle was a little sticky. The cork was dry when I pulled it, though, so it may have happened at some point on its trip to Massachusetts. Whatever happened to it, it wasn't flawed so I pushed on. In the glass the wine was a medium purple-ruby color that was translucent at the core. The nose was very aromatic powerful candied red berry fruit, roses, sweet cherry and strawberry. On the palate the wine was medium bodied with fairly high acidity, light tannins and a touch of sweetness. There was bright strawberry and red cherry fruit with a touch of chocolate and rosewater. The wine was juicy and lively on the palate and was very easy to drink. I had mine with boysenberry jam glazed duck breasts, and it was a very nice match. I'd probably stick with light meats in slightly sweet sauces for this wine, as it doesn't have the body to hang with richer meats and the little bit of sugar in the wine needs something to match up with. Like the sparkler above, I suspect this would be a crowd pleaser of a wine that would appeal especially to people who don't like drier, more austere red wines. The bottom line is that it's a fun wine with a more serious side to it that should appeal to tasters and drinkers across a wide palate spectrum. It's with something like a heavy heart that I bid a temporary farewell to the nation of Georgia and its wines. I still have a few Mukuzani wines in my cellar that I plan to drink, but today's post is likely the last one from this country for quite some time. I have exhausted the one shop where I have been able to find these wines, so, barring an unexpected discovery, this is likely it. Georgia was the first real discovery for me with this website and while they aren't exactly producing mind-blowing wines at the moment, I see a lot of potential there and will be keeping an eye out for future developments. It has been very enlightening and interesting for me to taste these wines and research the history of a region with such a great vinous legacy. Today's wine is called Tvishi and it's made from the Tsolikauri grape. Tvishi is the name of a small village in the Rioni Gorge of the Lechkhumi province in north-central Georgia. The Rioni Gorge is formed by the Rioni river which is apparently a hot spot for white water rafters. The 1965 edition of Wines and Cognacs of Georgia describes Tvishi as "refreshing with a fruity flavour," and promises "one who has ever tasted this wine will never forget its delicate and gentle bouquet and inimitable harmonious taste." I'm still not sure what the numbering convention means in this book, but for what it's worth, Tvishi is listed as No. 19. Tsolikauri is widely planted throughout Georgia, accounting for an estimated 90% of plantings in Western Georgia. It is used in the production of still dry and semi-sweet wines and is also used for distillation into spirits. According to Russian statesman Vyacheslav Molotov (of the Molotov-Ribbentrop pact, AKA the Nazi-Soviet non-aggression pact enacted in 1939), Tsolikauri was a favorite of Joseph Stalin, who was himself born in Gori, Georgia (which is located between Tvishi and the capital city of Georgia, Tbilisi). The bottling I was able to find was a Marani (Telavi Wine Cellars) from 2008 which set me back $16. Marani is actually a Georgian word that refers to the room where the large buried clay jars (called kvevri) used in traditional Georgian wine making are located. Telavi Wine Cellars is a thoroughly modern operation (though their website seems to have not been updated since the 2003 vintage) that does not vinify their wines in the traditional way, and my guess is that this was vinified in stainless steel. In the glass, this was a pale lemon color with hints of green. The nose was interesting with honeydew melon and white flower aromas. On the palate, the wine was medium bodied and semi-sweet with medium acidity. There were ripe flavors of apricot, honeysuckle and a bit of ruby-red grapefruit juice. It is really dominated by stone fruit and floral flavors, though, and there is just the faintest hint of citrus. This was much more balanced than some of the semi-sweet Rkatsiteli wines that I tried and is probably the most well-integrated white wine that I've had from Georgia. The sweetness was nicely counterbalanced by the acidity so that this never tasted cloying or treacly. Think fleshy off-dry Riesling with the acidity dialed back a bit and you'd be in the ballpark here. This could certainly work as a dessert wine, but it would also be nice with light, spicy foods as well. 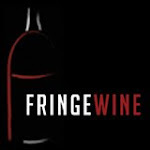 It can be difficult, at times, to decide what exactly constitutes a "fringe wine." There are definitely no-brainers on each side of the line: it's highly unlikely that Cabernet Sauvignon or Chardonnay will ever find a home on this site, while grapes like Rkatsiteli and Grignolino are obvious candidates. Verdicchio falls into a grey zone for me. It is geographically limited to a small region, but that region is able to pump out a relatively high volume of wine. In that respect, it resembles Garganega (Soave), a grape I probably will not write about due to its high production volume and ubiquity. I was leaning towards excluding it until I came across a sparkling version. Verdicchio is widely grown in the Marche region of Italy on the eastern coast (we've paid a brief visit to Marche here before). The most prolific zone for Verdicchio production is the DOC Verdicchio dei Castelli di Jesi which is responsible for one-half of all DOC production in the Marche region. For many years, Verdicchio from the Marche was a mass-market item, creating thin, oxidized wines due to over-cropping and poor winery management. 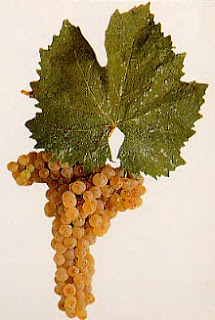 Several decades ago, Verdicchio had much the same reputation as modern day Pinot Grigio or mass market Soave wines. There has been more of a concentration on quality from many producers, though, and as a result, the wines from this region have been steadily improving. The grape itself is thought to be native to the Marche region. As you can see from the picture above, the grapes are very green, or verde in Italian, and this coloration provides the root for the name Verdicchio. It appears to be related to Greco and also several different subtypes of Trebbiano. It is late-ripening and a prolific yielder, requiring a diligent, heavy hand in the vineyards to prune excess grapes during the summer months. It is also naturally very high in acidity, a trait that lends itself very well to sparkling wine production. Sparkling wine production in the Marche dates back to the 19th century where spumanti made from Verdicchio grapes were among the first sparkling wines produced in all of Italy. Sparkling Verdicchio is not uncommon within the Marche region, but it is unusual to find a bottle landing stateside, as very little of the production is exported to the US. I was able to find a bottle from Fontezoppa called Voile Blanche Brut for about $12 from my friends at Bin Ends (like many sparkling wines, this was a non-vintage bottling though their website indicates the most recent bottling is a 2009). In the glass the wine was a pale, silvery straw color with a steady bead. The nose was fairly neutral with some crisp apple and baked pear notes. This wine was vinified using the Charmat method, so there wasn't any of that toasty yeastiness like you might get in a Champagne. In the mouth, the wine was medium bodied high acid and a soft and creamy mousse. There were green apples, bitter almonds and a kind of herbaceousness lingering around. The finish is clean and a little minerally. This is more Cava than Champagne and makes for a nice refreshing drink either as an aperitif or as an accompaniment to lighter seafood dishes. It's easy to forget sometimes that there's more to France than Bordeaux, Burgundy, Champagne, Alsace, the Loire Valley and the Rhone Valley. It's possible for one to spend their entire life trying to dig to the bottom of any of those regions. These are certainly the best known and most prestigious regions, but wine is made all over France and there are a few areas that are still a bit off the beaten track when it comes to worldwide recognition of their wines. Savoy is one of those regions, and just northwest of Savoy is Bugey. Bugey is a small region located in the southeast of the Ain department of France. Historically, Bugey has had ties to both Burgundy and Savoy, being a subsection of each for a period of time. For many years, wines from Bugey were classified as VDQS which is the little used classification for wine regions in the process of being promoted from Vin de Pays to AOC status. Promotion to AOC status was finally granted in May of 2009. The total vineyard area for Bugey is 500 hectares, or about 1,250 acres. There's a cool online map here that you can use to see where the different producers are located within Bugey. Much like Savoy, the bulk of production here is white wine. The wine we are concerned with here, however, is a red wine produced from the Mondeuse Noire grape. 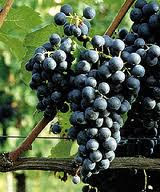 Mondeuse is grown in both Savoy and Bugey, though it is not widely planted in either of those regions. It is thought that there are less than 500 acres in all of France and I guess there are plantings of it among the New World wine countries, but it's certainly not planted in any significant numbers. It was thought for many years that Mondeuse was the same grape as the Italian Refosco dal Pedunculo Rosso, but recent DNA profiling has shown that they are two distinct varieties. There is a Mondeuse Blanche, but it's also unrelated to Mondeuse Noire (though, interestingly, Mondeuse Blanche is one of the parents, along with Dureza, of Syrah). I was lucky enough to find a bottle of 2007 Domaine Thierry Thissot Bugey Mataret for $17 (if you can read French, here's a site with some information on the fairly young estate). In the glass, this wine was ruby colored with medium saturation. There were aromas of red plums, raspberries, redcurrant, tart cherry and a bit of spice and damp leaves. In the mouth, this was medium bodied with very high acidity and faint tannins. There were raspberry, redcurrant and tart plum flavors with a bit of a metallic taste kind of lurking in the background along with a bit of earthy spice. This was bright and juicy and pretty refreshing for a red wine. It was somewhat reminiscent of a cool weather Pinot Noir or a Blaufrankish. From what I was able to read on the website about this winery, this estate was founded in 2001, so the lightness here could be due to young vines, or it could just be a cool-weather zone. From what I've read, the versions from Savoy are a bit heftier than this and some of them can be kind of gamey, but this is nice and very enjoyable. I would pair this the same way I'd pair a light Pinot Noir and just stay away from heavy red meats or grilling/broiling applications. I don't want to alarm anyone, but we're going to brush up against our old friend Bonarda again in this post, so let's all put our serious faces on and buckle up once again. The wine in question today is called Sangue di Giuda (or "Blood of Judas" in English) and it's made in the Oltrepò Pavese region of Lombardy in north-central Italy. Lombardy is bounded to the north by the Alps, to the west by Piedmont, to the east by the Veneto and Trentino-Alto Adige and to the south by Emilia-Romagna. Oltrepò Pavese is in the southwest of Lombardy, touching the boundaries of both Piedmont and Emilia-Romagna. It is thought to be the first region in Italy where Pinot Noir was planted. Quality here is very variable: the region is a big time producer of bulk wines, turning out production figures comparable to production powerhouse Soave in the Veneto. Oltrepò Pavese has two offical subzones: Buttafuoco (which apparently means "sparks"...who knew?) and Sangue di Giuda. Sangue di Giuda wines can be comprised of the following varieties: Barbera 25-65%, Croatina 25-65%, Uva Rara, Vespolina and/or Pinot Noir 45% max. The bottle I was able to find, the Bruno Verdi Paradiso 2009 ($17.50), is made up of 65% Croatina, 20% Uva Rara and 15% Barbera. Barbera is widely grown throughout Italy (it is the second most planted red grape behind Sangiovese), so I'm not really going to write much about it here, but Croatina and Uva Rara are, as the latter's name might suggest, a little more obscure. Croatina (which you can read much more about in this post) is grown mostly in northern Italy where, unfortunately, one of its many synonyms includes Bonarda. Croatina is unrelated to the grape previously featured in a post on this website concerning the Argentinian Bonarda (which, as helpfully pointed out in the comments to that article, seems to be actually related to the French grape Corbeau rather than an Italian variety, as I had surmised). It is also unrelated to Bonarda Piemontese, which Joseph Bastianich and David Lynch refer to as the "real Bonarda." It's kind of tricky. If you're in Oltrepò Pavese or Colli Piacentini (in Emilia-Romagna), then Bonarda means Croatina. If you're in northern Piedmont, what's called Bonarda Novarese is actually Uva Rara. If you find something labeled "Bonarda Piemontese," buy it for me and I'll reimburse you for it, because it's apparently pretty rare even though it's the "true" variety for the name in Italy. To add to the confusion here, when you try to look up Uva Rara on Wikipedia, it automatically redirects you to the page for Vespolina, but I believe that these are two different grapes (especially given that they are listed separately in the DOC regulations and because they are given separate entries in Oz Clarke's book, Bastianich and Lynch's book and on winecountry.it). To sum up, Croatina and Uva Rara are distinct grapes that are unrelated not only to each other, but to other grapes that, like them, march under the Bonarda banner in any of the many places that something called "Bonarda" is planted. So, let's just pretend for a minute that we've got the grapes straight and move on. As a final twist, the DOC Oltrepò Pavese Sangue di Giuda doesn't necessarily tell you anything about the style of wine in the bottle. Sure, we know what the grape varieties are, but the wine can be made in a variety of styles ranging from dry and still to sweet and frizzante. There is no restriction on the wine style in this DOC, only restrictions on the grape varieties that can be used. How do you know what's in the bottle? Well, the alcohol content is a pretty good indicator as to the sugar content of the wine. Lower alcohol contents (under 9-10%) mean that there's probably some residual sugar that wasn't fully fermented. Something in the 12-14% range almost certainly mean the wine was fermented to dryness. As to whether the wine is still or frizzante, I'm not sure if there are any dead giveaways. I would guess the sweeter wines are more likely to be a little bubbly while the dryer wines are more likely to be still, but if you aren't sure, you either have to roll the dice or ask someone at the shop to let you know. The Bruno Verdi Paradiso bottling clocks in at 7.5% alcohol and is slightly sweet. In the glass, the wine had a dark mulberry color with slight but visible bubbling. The nose was thick with crushed berries, dark plums and black cherry. It has a very alluring fruity smell to it. In the mouth, the wine is slightly fizzy and just a touch sweet. It is very grapey and fruity. It makes think about what grape soda would taste like if they took about half the sugar out. It has a rich texture and good acid with luscious purple and black fruits. Stylistically, I would say that this is right between a bone dry Lambrusco (a real one, not Riunite) and a sweet Brachetto D'Acqui. The sugar in this isn't so heavy that it must be relegated to the dessert table and I think it would be very interesting with a spicy barbecue meal, though it would be equally at home with a light dessert as well. Santorini seems like kind of an awesome place. It's a little set of islands in the Aegean Sea that is the remnant of a massive volcanic explosion about 3,600 years ago which blew the top off of a volcano, leaving the Santorini caldera behind. There are some people that believe that this explosion and its aftermath were the inspiration for Plato's description of the lost city of Atlantis. On the inside of the curve, there are steep cliff faces that drop as much as 300 meters straight down towards the lagoon. The capital city, Fira, is scattered along a hill top and some of the towns have buildings that seem to be just hanging on the edge of the cliffs. The topsoil is made up of different layers of volcanic ash, which is not necessarily a good thing for agriculture but makes for some pretty stunning black-sanded beaches. The underlying soil is made up of chalk and shale. Miles Lambert-Gocs, in his The Wines of Greece, compares the landscape of Santorini to the surface of the moon with ashy greyness stretching in all directions. Not only is the soil on Santorini inhospitable to agriculture, but the climate is as well. Santorini and another Greek island called Anafi are the only two areas in all of Europe whose climate can be categorized as "desert" according to the Köppen climate classification system. What this means is that these areas receive fewer than 10 inches of rainfall a year, which is considered too low to sustain any vegetation. In order to combat these arid conditions, the vines are spaced very far apart, in much the same way as in La Mancha, Spain. The distance between vines can be as far as 2.5 meters. The primary source of moisture for these vines is the morning dew and the air moisture captured by some of the clay in the soil. As a result of the spacing and the low moisture, yields here are incredibly small, amounting to 10-20% of the average yields found in France or Italy. Santorini is very windy due to the fact that the island is basically a big hill in the middle of the ocean and because the land is too dry to support things like trees that might block some of the wind. 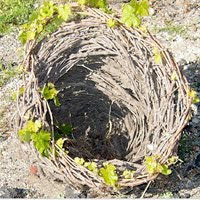 In order to combat these fierce winds, the vines are trained in unique basket shapes where the stalks of the vines are trained into spirals which the grapes sit in the middle of, protecting both the stalks themselves and the grape clusters from the harsher elements of the weather with the major downside (from a producer's point of view) being that the grapes must all be hand-harvested since you can't get a mechanical harvester into one of those nests. One good outcome of the harsh climate and remote location of the island of Santorini is that phylloxera never made it to the island, or, if it did, it was unable to survive in the harsh conditions. The vines here are ungrafted and can live for over 70 years. Assyrtiko (and its many synonyms made by substituting "y"s for "i"s and "k"s for "c"s) is the most widely planted grape varietal on the island of Santorini, accounting for 70-80% of vineyard area. It is thought to be native to Santorini, though it is also widely grown throughout the Greek island system and on the mainland. It is perhaps best known as a blending partner with the Savatiano grape in the production of Retsina. 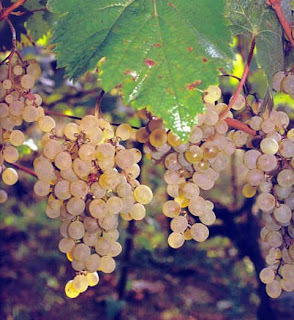 It is a hardy grape that is resistant to many diseases and adaptable to different climactic conditions. It is naturally very high in acid and tends to find itself in blends (though there are 100% varietal wines produced) with other grapes either to boost their acid content (such as in Retsina) or to temper its own high acid as in the 2009 Sigalas Assyrtiko/Athiri blend that I tried. The Sigalas wine ($18 retail) has a mixture of 75% Assyrtiko with 25% Athiri. Athiri is a very old Greek varietal which is named for "Thira" or Thera, which is the name of the largest island comprising Santorini, indicating its historical ties to this region. In the glass, this wine was a very pale, light straw color. It had a moderately open nose with aromas of grapefruit and lemon peel and a kind of clean, rainwater smell. On the palate, the wine was full bodied and kind of oily-textured with high acid. There was a bit of white grapefruit fruit, but there was mostly this very steely minerality that lingered very nicely. This was bright, crisp and very clean that was a much larger mouthful than I was expecting. It cane be tough to balance an oily textured wine, but the acidity here is great and very refreshing, making this a very versatile food wine. The other Assyrtiko wine I sampled is a bit more complicated. Anyone who has spent a good deal of time around Italian wine, especially Tuscan wine, has probably come across Vin Santo. Italian Vin Santo is made by drying grapes, typically Malvasia or Trebbiano, on straw mats before pressing them and then barrel aging them. The style can vary from a dry sherry-like drink to a syrupy, rich dessert wine depending on the region and the winemaker. Well, it turns out that Greece also has a Vin Santo. 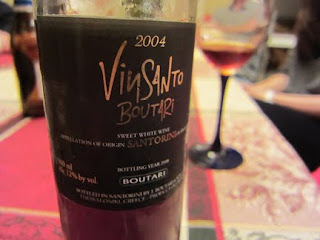 My wife was actually shopping for a bottle of the Italian stuff and came home with a 2004 bottling from Boutari ($30 for 500ml) made from Assyrtiko and Aidani grapes instead. She was disappointed in her honest mistake (until we drank the wine), but I was excited since this was something I had never heard of before. Surely there must be some kind of connection between these two wines, one might think. Well, it doesn't appear so. In an impressive display of wine geekery and scholarship, Jeremy Parzen, over at Do Bianchi, has made a pretty good case for the wines only sharing homonymic resemblance. The name Vin Santo (I tend to see it more commonly printed as vinsanto) for the Greek version probably comes from a contraction of Vino Santorini, whereas in Italy, Vin Santo (or "holy wine") is so named because of its use in church services. In any case, it's fascinating reading for those of a certain geeky persuasion and I encourage you to follow his series of articles provided in the link above. The Greek vinsanto is made from grapes that are sun-dried (as opposed to indoor mat-drying as is done in Italy). The blend that I picked up was made from 50% Assyrtiko and 50% Aidani, another native Greek varietal found only on the Cyclades islands in the Aegean which is used almost exclusively in blends due to its low acid content. This wine was aged for four years prior to release. In the glass, the wine had a tawny, dark amber/reddish brown coloring. The nose was full of roasted hazelnuts and almonds, raisins and maple syrup. On the palate, the wine was medium bodied with surprisingly high acidity. There were flavors of honey and maple, golden raisins and dried red fruits along with toasted almonds and a kind of spicy orange twist. This wine was sweet, it's definitely a dessert wine, but not syrupy thanks, I think, to the high acid provided by the Assyrtiko grapes. That acid really kept this lively and interesting in the mouth for me. I've had a lot of sweet wines that taste amazing at first but which get old really fast because your palate gets beaten into submission by the relentless sugar assault. The nice acid here keeps this interesting and alive in the glass. This is a wine I will not hesitate to purchase again and I would be very anxious to try it with my southern-style pecan pie.